The project is proposed to have 2 towers, each 38 storeys high, with 748 mixed condo units in total, with unit sizes ranging between 457 sq. ft. and 1510 sq. ft. It will be the Toronto’s #138 tallest and Swansea’s #1 tallest condominium tower. 1926 Lake Shore Boulevard West, Toronto will soon be home to Mirabella Luxury Condos 2, a new condominium project by Diamante Development Corporation, when completed. The development is currently in pre-construction. The anticipated occupancy date for Mirabella Luxury 2 Condos is slated for January, 2021. Registration is ongoing. Mirabella Luxury Condos 2 will feature great amenities that will include 24-hour concierge, outdoor landscaped terrace along with outdoor seating plus barbecue areas, dining room, party room with kitchen, guest suites, an indoor pool, a fully equipped fitness facility, yoga studio, children’s play area, pet grooming area, library, and business centre. Mirabella Luxury Condo location has a Transit Score of 83 out of 100, with several TTC Transit alternatives along Lake Shore Boulevard. The Gardiner Expressway can be easily accessed, bringing you speedily into the hub of downtown Toronto, also leading to the QEW and Highway 427 stress-free. Apart from the beautiful lake and several parks, you can enjoy the amiable and serene neighbourhood, too. Along the Humber Bay Shores are country clubs as well as boating clubs. Sobeys, Pet Valu, and Pier21 are in close proximity for your shopping needs. Living by the lake will allow you to have limitless views of the sun dancing against the lake. There is no dull moment here; nature awaits you along the Sunnyside Boardwalk, and at the beach – at Sir Casimir Gzowski Park. Have a great time at Sir Casimir Gzowski Dog Park with your pet. Enjoy nature walks in High Park, with the Sakura cherry trees. 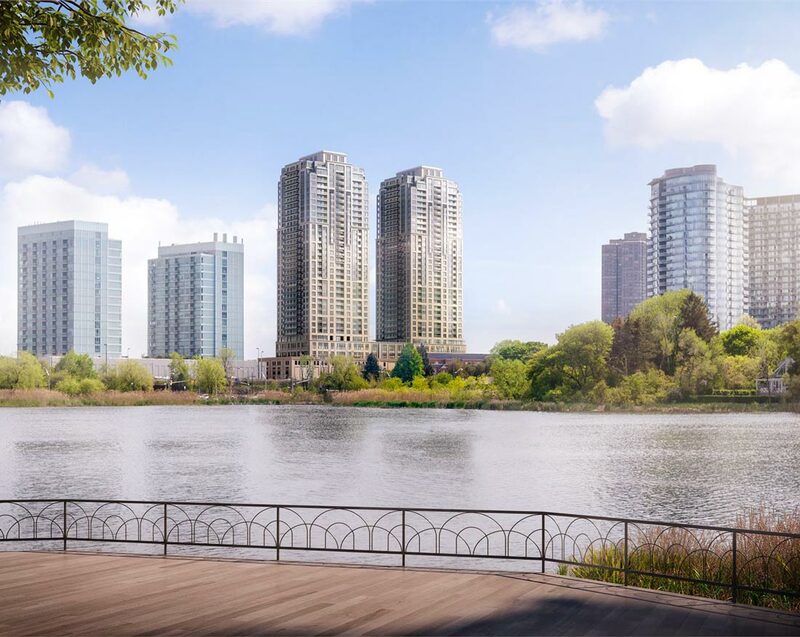 Mirabella Luxury Condos 2 offers you a rare opportunity to reside by the lake on Toronto’s waterfront with lively sunrises, sunsets, lush parks and boardwalk strolls – with the condos luxury unfolding in an array of unrivalled private and social amenities. At Mirabella Luxury Condos, you will not only enjoy the stunning lakeshore views but live in luxury as well – with the condo’s elegant suites and exclusive amenities ideal for your lifestyle.